When it comes to spirit pairings, I’m an unabashed fan of bourbon and rye. No matter the season, fine American whiskey works. As for other spirits, I’m more seasonal in my preferences. The tropical-influenced rum is ideal for the warmer months, but when it gets a little cooler I’m inclined towards scotch whiskey. Something about the smokey, warming qualities of a single malt hits the spot. And yet, all that time with American whiskey has left me finding most of the 80- or 90-proof scotch lacking in intensity. Fortunately, a few scotches have a higher proof. And lately, cask-strength scotches have become some of my favorites. (Unlike American whiskey, where cask-strength can mean 130-proof or higher, cask-strength single malt tends to be in the 110-120 range.) Glenfarclas 105 is one of those cask-strength single malts, weighing in at a hearty 120-proof (60% ABV). Its Highland distillery is one of the few truly independent distilleries left in Scotland, and also one of the few that produces a cask-strength scotch that is readily available in the U.S.
Glenfarclas ($80-90) has a deep golden color. The nose is an inviting combination of toffee with pear and cherry fruit. On the palate, Glenfarclas really shines. It’s multi-layered on the palate with more pear, lots of sherry, and a slight smokiness. It has a nice, full-bodied creaminess, and a finish that fades off nicely with oak and subtle smoke. The 105 is very even-keeled for 120-proof. It has plenty of intensity without being over the top. The richness of sherry with a champagne-like balance. Drink it with a medium- to full-bodied cigar. Think a Cabaiguan, Davidoff Colorado Claro, Intemperance, or Tatuaje Black. I’m sure cask-strength single malt isn’t for everyone. 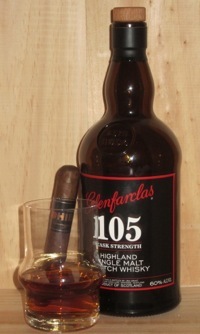 But if, like me, you like higher proof bourbons and ryes, but still find the smokiness of scotch up your alley, give the Glenfarclas 105 a try.